In sum, CCR Section 6618 requires certain notifications to be provided to the “operator” of the property where pesticides are being applied, as well as to persons whom the operator has reason to believe may enter the property during and after the application period. Unfortunately, CCR Section 6618 is vague and somewhat confusing to interpret, especially due to its references to “fieldworkers,” “agricultural plant commodities,” and “commercial and research production.” As a result, a number of our HOA clients have requested guidance on the extent to which they must comply with CCR Section 6618, as well as the steps needed to do so. Our attorneys have also published this information in an article that is available for download from our Web site’s library. The precautions printed on the pesticide label or included in laws or regulations to protect persons during the application. “Pesticides” include anything with a Material Safety and Date Sheet label (“MSDS label”), such as insecticides, herbicides, weed killers, and the poison in bate stations to be applied by the HOA’s pest control and landscape vendors. Those vendors, as “pesticide applicators,” must satisfy these notification requirements prior to the pesticide application date. Doing so is vital to enabling the HOA to then satisfy its notification requirements to its members (discussed further below). CCR Section 6618(b)(2) requires the HOA, as the “operator” of the property, to give notice to all of the HOA’s members and residents of essentially the same three (3) items required by CCR Section 6618(b)(1). The HOA may satisfy its notification requirements by posting, Emailing, or mailing the pesticide disclosure to the HOA’s members and residents. Effective January 1, 2014, HOAs are required to designate a location for posting “general notices” which should be a prominent location that is accessible to all members. Civ. Code §4045(a)(3); §5310(a)(3). 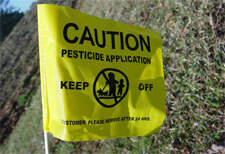 The HOA should therefore post the pesticide disclosure in the location for posting general notices. If such a location has not been established, the pesticide disclosure should be included with the billing statement or HOA newsletter. The disclosure should be provided at least thirty (30) days prior to the scheduled pesticide application date. There may be instances where multiple pesticides are being applied in the community. In those instances, the various precautions on the MSDS labels could be voluminous and thus burdensome and expensive to distribute. We therefore recommend that a copy of the pesticide information provided by the HOA’s vendors be kept at the HOA’s management office for members to access if necessary. Additionally, the pesticide information can also be provided on the HOA’s website if one has been established. The way in which the HOA can best avoid being burdened with having to provide lengthy disclosures is to provide the members with contact information for the HOA’s vendors (discussed further below). The HOA’s Board should thus require any HOA vendors applying pesticides in the community to maintain a toll-free number and/or web site for members to obtain more detailed information about the pesticides being applied at the HOA. The Board may also want to provide the membership with the web site addresses for the DPR (http://www.cdpr.ca.gov) and the local entity that enforces these pesticide regulations (i.e., for an Orange County HOA, the OCAC’s web site address: http://ocagcomm.com). Where the HOA has a contract with a vendor for periodic pest control, the HOA should provide the frequency of pesticide application to the HOA’s members. If there are no changes in the vendor’s weekly or monthly application of pesticides, or the types of pesticides being applied, then quarterly pesticide disclosure is recommended. The OCAC further recommends immediate notification to the members of any change in the scheduled frequency of pesticide applications or change in the types of pesticides being applied. In order to ensure that the HOA’s vendor satisfies its notification requirements to the HOA, and to allow for the HOA to in turn satisfy its notification requirements to the membership, we strongly encourage the HOA’s contracts with its vendors to include certain provisions with regard to this issue. For example, the HOA’s contract should obligate the vendor to provide the required pesticide information to the HOA’s management at least forty-five (45) days prior to the pesticide application. Additionally, the vendor contracts should include the requirements that (1) only “State Certified Applicators” or those supervised by a State Certified Applicator may apply pesticides at the HOA, (2) that the vendor provide the HOA’s management with written, up-to-date information regarding all pesticides with an MSDS label being applied at the HOA, and (3) that the vendor maintain a toll-free number and/or web site where the HOA’s members can obtain additional information about the pesticides being applied at the HOA. We have provided our clients with simple contract addendums that can be used for this purpose, and to further prevent the HOA’s management from having to “hound” the vendor for the required pesticide information. HOA vendors that perform pest control services have a major role in providing HOAs with the pesticide label and application information that must be disclosed to the HOA’s membership. That information includes (1) the date(s) of the scheduled application of pesticides in the community, (2) the identity of the pesticide by brand or common chemical name, and (3) the precautions printed on the MSDS label or included in laws or regulations. This information must be given to the HOA’s members prior to the scheduled application date through posting it in the HOA’s location designated for the posting of general notices. In the alternative, this information can be mailed/Emailed to the members, contained in the HOA’s newsletter or posted on the HOA’s web site. The notifications should be provided on a regular basis and at any time there is a change in the frequency of application or the type of pesticides being applied. The HOA should also require its vendors that are applying pesticides to maintain a toll-free number or web site for members to obtain additional information regarding the pesticides being applied at the HOA. The application of pesticides is a serious issue. The best way to ensure that the HOA is given the information it needs to comply with CCR Section 6618 is to incorporate appropriate terms in the HOA’s contracts with its landscape and pest control vendors. Those terms will prevent the HOA from being subject to fines/penalties, as well as claims against the HOA brought by individuals who themselves or their pets suffer ill-effects from pesticide exposure. The information above can be obtained in our article entitled “HOA Compliance with California Pesticide Regulations” that is available for download from our Web site’s library.